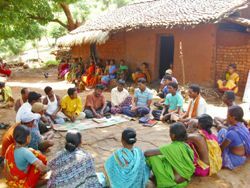 Shakti was formed in the tribal dominated Rayagada district in 1992 by a group of educated and highly motivated persons wishing to address the underlying causes of poverty, poor health care, literacy and livelihood insecurity. The name ‘Shakti’ was chosen because this means ‘empowerment’ in Hindi. to strengthen the Panchayatraj Institutions.